Be sure to measure area prior to purchasing product. Do not adhere product to any surface until you have all the stone needed to complete the project. Test (dry fit) the product to see to if is going to work well with the area prior to purchasing a large amount of the stone. One ton covers about 100 sq ft. 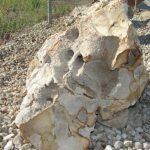 Rocks and boulders provide wonderful eye appeal, and they can turn the front or backyard into a thing of beauty. Best of all, these inanimate landscape design elements never need to be watered, weeded or cared for. They provide a wonderful sense of permanence, and years of carefree enjoyment for the homeowner. Accent boulders can add a lot interest, impact, and character to your landscape. They can even add a second or third level to your landscape without actually having to create an elevated area. Another tip here is: that really catchy and appealing designs have more than one level. Smooth flat multi colored stone, tones of red, ten, gray & greens. Small average weight1-2 lb average weight of a medium one is about 1-3 lbs. Large 4 – 7 lbs ea. Perfect for creating a unique focal pointe. Named because of its resemblance to natural Cedar Bark. Brick or Brack are large pieces of our Cedar Bark Stone. From 8 to 16 inches in size can be used as a border for landscape areas. 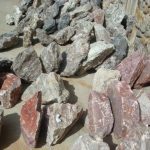 Large chunk shaped boulders, available in tones of gray/ black, silver, and red, all with silver sparkles throughout, by far our most fancy, sparkly stone available. 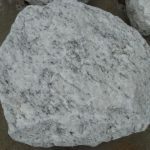 Bright white boulders with onyx colored sparkles, chip or chunk shapes boulders, perfect for use as an accent piece in the garden or wonderful for constructing an impressive edging/ boarder. Available in a larger and smaller sizes and goes perfectly with white marble and shell. South American Beach Pebbles (not polished) This is a small boulder 3 to 5 inchs in size. With a smooth surface, bright speckles, and hues of gray vary throughout each stone. Popular in small flower beds, shrubs, and as a border. Known as Firelite Rock , it was inspired by the Volcanic Islands of the Pacific. As the name implies, Firelite Rock is man made by fire. 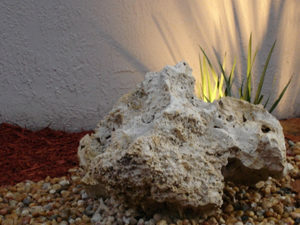 These stones look great around tropical trees and landscapes. 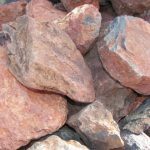 Dark red in color, large chunk-shaped boulders which are very porous, making them light weight and easy to transport. Unique boulders make for perfect accents in any landscaping and look great with regular lava rock. Also known as White Marble Boulders, these small White/gray boulders sparkle in the sunlight. They vary in size from 6 to 12 inches. 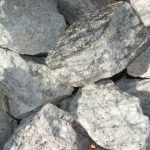 Many pofessional landscapers use these boulders to make borders around trees or flower beds. Also known as Limestone Boulders. 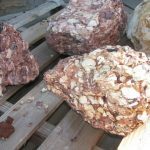 These small to extremely large rocks are perfect for lawn accents and to help block unwanted traffic in your lawn. 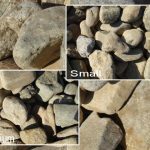 Small, medium & large: natural smooth rocks usually a variety of tans and browns. Available in sizes ranging from 1 lb to 1 ton. 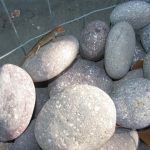 The small river rock boulders will easily fit into the palm of your hand and can weigh anywhere from 1 to 3.5 lbs. Medium river rock boulders are small enough to lift with one hand and weigh from 4 to 10 lbs. 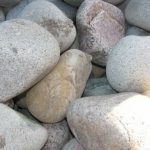 Large river rock boulders can be anywhere from one-man boulders, meaning one person can lift them alone, up to large boulders that 2 or more people would be needed to lift. The average size of our large river rock boulders are 40-100 lbs. 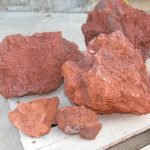 Used in a number of ways, as edger/boarder to landscape beds, used as accent pieces in the landscaping, larger boulders can be used as a seating area, great for water features, in and around ponds, also used in fish, snake, lizard and turtle tanks.